Thank you to Dr. Spriet for taking the time to share his knowledge with us. For more information visit his University of Guelph page. 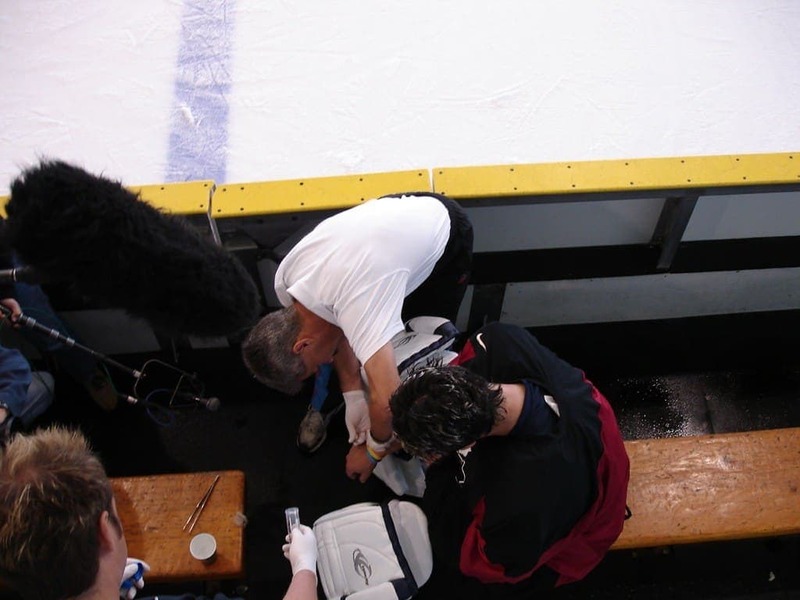 If you watched the World Junior Championships on TV in Canada you would have seen the Gatorade infomercials showing researchers studying sweat loss in the Canadian players and their needs for proper fluid replacement. 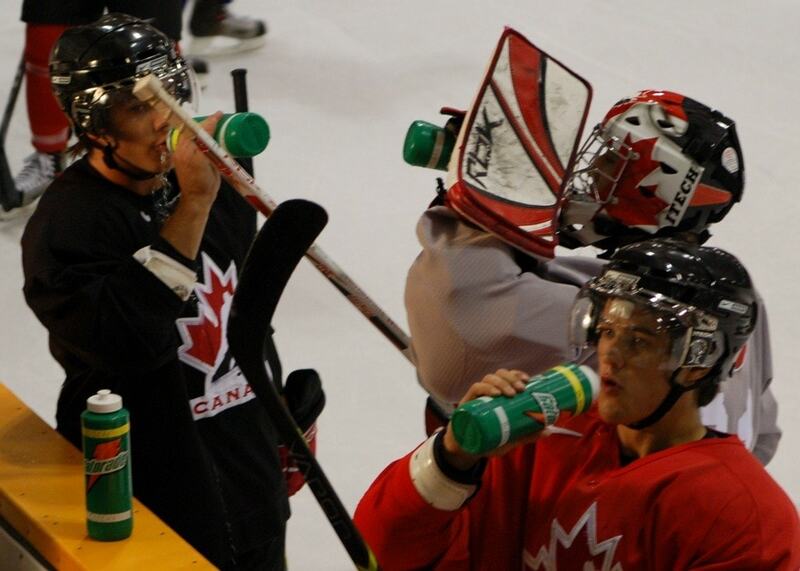 A group of researchers, supported by Gatorade, were able to join the Team Canada Training Camp for a day and study the hydration of the players before, during and after practice. The infomercials hit home for me because I did my graduate studies in sport science – and I’m also old enough to have played for coaches who thought it was bad to drink even water during a game! If you didn’t see the infomercials, we have them here. I wanted to see how that research would apply specifically to goaltenders. We’re on the ice longer and we wear far more gear – and of course we all work harder, right? So if players experience significant fluid loss and need to consider how and how much they replace, that must go double for us. The scientific star of those infomercials is Dr. Lawrence Spriet of the University of Guelph in Ontario. Where else to go, but the source? Dr. Spriet was happy to speak with me for inGoal Magazine and tell us how his research applies specifically to goalies. The interview was interesting as it touched on many areas beyond the world junior squad. They have had the opportunity to test the Guelph Storm more extensively, even in games. They have also worked with the New York Rangers and Dr. Spriet consults informally with Nashville goaltender Dan Ellis – who once lost 13 pounds due to sweat in a single game! Losing only 1-2% of your body mass can impair performance – that’s as little as 2 pounds for a 200 lb. 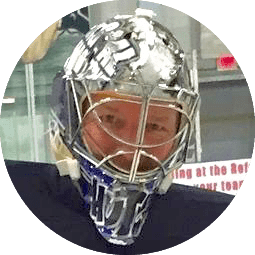 goalie – less for you fit types! Players lost on average 1.8 L per hour of fluid – to replace that fluid you would need to drink nearly two large water bottles. And certainly one full bottle to stay within the 1% loss of body mass. 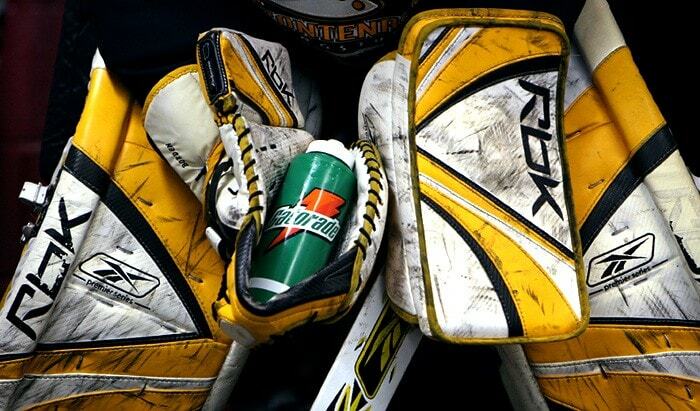 Goalies averaged 2.9L lost in an hour – 3 very large water bottles! The goalies did drink the most – 1.8 L on average – but they still lost on average 1.1% of body mass. You have to assume that these well-trained young men were taught in their careers about the importance of hydration – yet 1/3 of them still lost more than 1% of their mass. The players were not able to maintain adequate sodium balance. The players tended to choose sports drinks before practice and plain water during. Suggest extra sodium sports drink to help replacement of sodium – drinking water only can be a real problem. Here are the specific comments about goaltenders. It is interesting to note the extra fluid loss is a particular problem in practices. Goalies sweat the most, losing 2.9 ± 0.2 Lh–1, and this can be attributed to their constant involvement in the drills during the practice — other players, upon completing a drill, waited for 4 – 5 of their teammates to complete their turns before repeating the drill. This allowed the players a chance to rest while the goalies were generally involved in many or all successive repetitions of each drill. The sweating response would presumably be different in game situations, as goalies are only required to react to game play in their end while other players are continuously active during their shifts. This is supported by a study by Green et al. (1976) that demonstrated much smaller increases in blood lactate for a goalie (n = 1, +153%) than for other players (n = 7, +325% ± 16%) during a game, despite similar fitness levels. 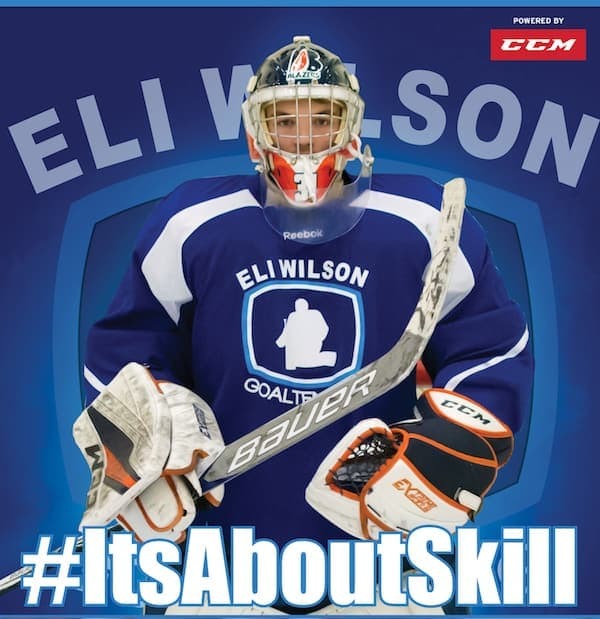 Bottom Line – How Should a Goalie Manage Hydration? The bottom line is that it is unsure how much this matters for non-elite players. The only way to be sure is to take your bodyweight before and after a game or practice – right before oldtimers, not after that extra hour in the dressing room or local watering hole! If you are losing more than 1% of your bodyweight you have a potential problem. Sports drinks have little value before a game, but are exactly what you need during a game – the extra sodium versions. You need a well balanced meal right after the game – if it will be delayed there are many recovery shake options that are essentially chocolate milk! You might also be interested in this piece from the Gatorade Sport Science Institute showing how they tested J.S. Giguere to evaluate his fluid loss. Great article, David! Could you make the paper by Dr. Spriet available for download? I’d be interesting in reading it. I can ask him for you…. We don’t hear enough about this. I had to convince my daughter that she really needs to increase her intake. She use to go for over two hours and not drink anything. Shortly after college, I found that drinking a decent amount of water during game day + throughout the game still resulted in waking up with a headache in the morning until someone suggested trying Gatorade. Ever since then I still amp up my water intake during the day and do a sport-bottle sized Gatorade during the game and another afterwards. No more headaches! I have tried the low-cal G2 with the same results, but prefer regular Gatorade for the taste. WATER! Indeed. Can’t stress the importance of that. If I’m going to face a difficult game, I’ll have Gatorade prior to a game. I buy the crystals and mix my own batch. During the game I’ll keep chugging water. I feel naked if I don’t have my water. I’d pooch out without it. Damn, even on a really bad day that would be mean. found this comment about Vita Coco on here and just wanted to second that notion, it is hands down the best in game and post game drink I have ever used, the amount of potassium in it alone makes it worth it…a little expensive and can be hard to find, but well worth it if you can find it! I think the more convincing GIguere video would be the one of him hurling in mask when he playe in Europe during the lockout. I was dehydrating after a game on way too many occasions…to the point where I developed a kidney stone. The stone had to be lasered out, and the whole process was something I never want to go through again. So, I was especially grateful to read this article. aside fom drinking plenty of water, I’ll include the sports drink as well. (I use G2, as I’m type 2 diabetic) Thank you so much for posting this article! Jay. so what do you think is happening when some of us older players play a full 60 minutes, drinking 1 water bottle (water) during the game and then go upstairs for a beer or 2 with the team. Does the fact that we are probably a bit under hydrated after the game affect how the alcohol could be affecting us? Of course this is strictly hypothetical. I expect you’ll know the answer the next morning. OK, let’s look at this a little more seriously, does a person’s hydration level affect alcohol absorption? I’m not sure, and if it does this could be an important topic to discuss. Fair question, but I was being serious in saying you really should replace fluids in the dressing room with water, not just beer. You might look strange doing it but bring a scale and weigh your self pre and post game – and you’ll get a quick indication of how much fluid you lost…1 kg (2.2 lbs) = 1 L approximately. Not that this answers your question I know…. I’ve found downing at least a full water bottle or more 15-20 min before a game definitely improves my performance and endurance, while drinking water throughout the game. Post-Game Pub = Beer + 2 glasses water. I feel great the next day and keep the beer league (gut) at bay! Yup! This article is right on the money. I used to drink only 750ml. bottle of water, and often had cramped muscles after or during a game (81 min. games) Until my doctor urged me to drink more and drink something better during and after the games. Cramps are gone since i drink a 900ml of water and 900ml of gatorade during the game, and 500ml of chocolate milk with a good chunk of cheese at home. (no beer whatsoever!) I still lose a couple of my 185 pounds but i used to lose 6 to 8pounds before. Most definitely a great article, I too would love to be able to download the paper that Dr. Spriet wrote if possible. I’ve read many articles on the use of Gatorade and other sport drinks but I’m a true believer in Gatorade. I ditto what another person said which was “We don’t hear enough about this.” There is a lot of truth to that statement. If you are as interested as I am about dehydration of goalies as well as the rest of the team you can find many things that have been written but you have to have a lot of time on your hands and now that I have retired I have a lot of that. I wish I was still coaching but my ealth wont allow this to happen but it doesn’t stop me from reading articles on goaltending and such. Back in the early seventies I had my own sporting goods store and I was one of the first people to carry Gatorade in my store including “Gator-gum” which was excellent but I guess it didn’t sell because it disappeared. I’ve always stressed the use of Gatorade during and after games and made sure that my goalies each had a bottle along with their water bottle. I also coached competitive soccer and made sure that there was Gatorade available for the players. I wish that an article such as this would reach out to all those parents, coaches and players who don’t believe in the use of Gatorade. Again, great article, now if we can get the coaches out there to make sure they always have Gatorade on the bench for games & practices. I mix in my bottle a full bottle of gatorade and a full bottle of water every game I play. Its the best hydration that ive found. Will never go back to just water. I recommend it, or at least try it. I’ve said what I wanted to say above but as I said before we need this information to reach not only the parents but all of the coaches plus the players and possibly the executives of every Hockey Association so we can get this GOOD NEWS out to everyone. Being a goalie, I drink water on the way to the rink,drink a bottle while I play, and post game I drink a Zico Premium Coconut Water Dark Chocolate 14 fl oz. No problems here.